Six players made their U.S. men's national team debuts, three–including two 18-year-olds–scored their first senior goals and the Americans had no problem dispatching a Bolivia side that served as a warm-up for a pair of tougher tests overseas. A young U.S. national team featuring many of the prospects fans have been hoping to see had no trouble defeating a poor Bolivian side, 3-0, on Monday night outside Philadelphia in the first of three friendlies that precede the World Cup. The USA, of course, isn’t going to Russia, and that’s forced interim manager Dave Sarachan to start the 2022 cycle early. He’s mixed and matched youth and experience during his time in charge, but at Talen Energy Stadium in Chester, Pennsylvania, he relied heavily on younger players. His starting 11 averaged just 22 years of age and included two born in the 2000s—and both scored. Overall, six men made their senior national team debuts. A Bolivian squad that was just as green, and not nearly as talented, offered next to no threat or resistance, and the Americans won easily. The tests will come later. Monday was about building confidence and a bit of momentum. The USA was on the front foot from the start, and absent any Bolivian pressure or obvious potential on the counter, Sarachan’s young attackers had time to get comfortable and grow into the game. The two players born in the 21st-century, Tim Weah and Josh Sargent, demonstrated some chemistry early, linking up on a sixth-minute give-and-go that resulted in Weah’s dangerous cross to Rubio Rubin. The American threat only escalated from there, but the youngsters couldn’t find the net. There was some smart one- and two-touch passing and a lot of time and space to work with on the flanks, but Bolivia did well once the U.S. entered the penalty area and took advantage of some poor American finishing. The USA outshot the visitors, 13-1, in the first half, and created seven corner kicks. Finally, it took a defender, Walker Zimmerman, to break the deadlock. His well-placed 37th-minute header off a Joe Corona corner sent the hosts into the locker room with a 1-0 lead. They were less zealous and far more effective after the break. In the 52nd, Sargent added to his goals at last year’s U-20 and U-17 World Cups with his first senior marker. It was a memorable one. He knocked down an awful pass by Bolivia goalkeeper Carlos Lampe with a slick overhead first touch, then powered his shot home. Seven minutes later, it was Weah’s turn. U.S. left back Antonee Robinson had all the time he needed to curl in a perfect cross, and Weah’s near-post run and side-footed finish were exquisite. The young Americans’ lack of precision in the first half, and then the ruthlessness and composure displayed in the second, was the story of the game. As long ago as October’s World Cup qualifying failure may seem, it was still part of what’s been a demanding, up-and-down season for Christian Pulisic. The Borussia Dortmund midfielder hadn’t played for the USA since that fateful night in Trinidad, and he arrived in his home state having appeared 42 times for his club during a trying campaign. "I feel like it's the end of my season. My legs are tired,” he said Sunday. For the most part, he looked it. It will come as no surprise if Pulisic, who played 88 minutes Monday, doesn’t take part in the USA’s upcoming friendlies in Europe (more on that below). 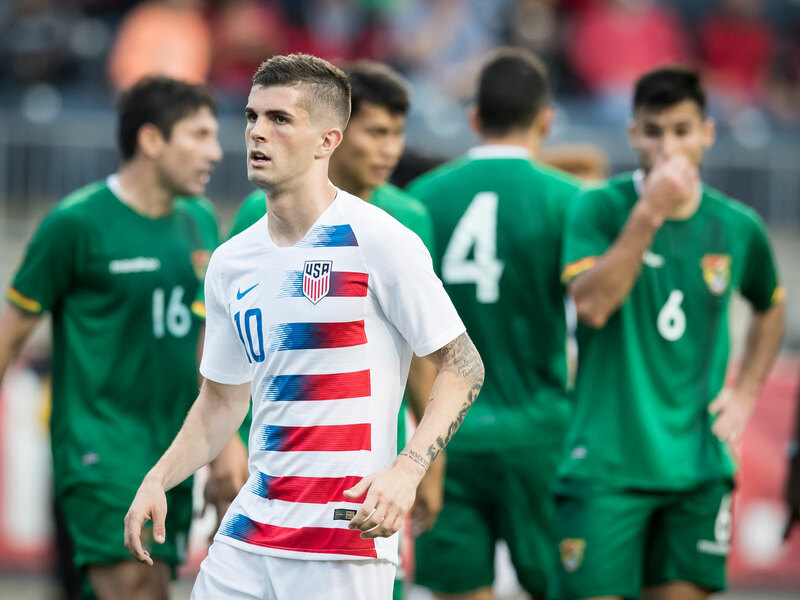 Playing against Bolivia as one of two central midfielders underneath Sargent, Pulisic wasn’t as involved in the attack as some of his teammates, and although he showed a couple flashes, the final product wasn’t really there. He took just one shot (a first-half effort that was blocked almost immediately and went out for a corner kick), drew no fouls, and failed on more dribbling efforts than he succeeded. He was marked relatively tightly and forced to be on the move and did well popping up in different parts of the pitch. It wasn’t a poor performance—Bolivia wasn’t good enough to force one—but it was clear Pulisic lacked the spark we’re used to seeing. His night ended a few minutes before the final whistle, just after he took a ball flush to the face. Pulisic remains the U.S. future, but what he needs in the present is some rest. Sarachan on Tuesday is expected to announce several changes to his team—perhaps as many as 10, according to reports—as the USA leaves for Europe. There, the Americans will face a pair of opponents a whole lot tougher than the meek Bolivian side they played Monday evening. On Saturday, the U.S. will meet Ireland in Dublin—the Boys in Green have named several experienced English Premier League players to their roster—and then on June 9, there’s a game against World Cup contender France in Lyon. If that’s the end of the interim road for Sarachan, he’ll have left his young team with a clear message: tactical structure is important at the international level. Players come and go, sometimes during camp, and even linchpins like Pulisic can be absent for months. So some level of tactical predictability—an identity, approach or system the players can anticipate when they come in, even if it’s been a while—is beneficial. Jurgen Klinsmann had little use for that sort of plug-and-play philosophy. Instead, he preferred multiple formations and roles, and strategic surprises. But the dynamism and creativity Klinsmann hoped to produce was replaced by regression and bewilderment. Knowing he was charged with getting a host of young players started on their international careers, Sarachan went the opposite direction. In each of his four games in charge, he’s deployed the USA in a 4-1-4-1, highlighting the squad’s apparent strengths in midfield (and lack of polished forwards) while providing tactical continuity to less experienced players. Results at this juncture obviously don’t matter. But considering the lack of seasoning in many of the players Sarachan has used, it’s noteworthy that the USA yielded just one goal in those four games. And on Monday, even though there were four debutants in the starting 11, the hosts were never threatened. And they were able to create some promising combinations going forward. There’s some creativity and flare in this group, and Sarachan’s decision to provide a bit of tactical comfort and cushion allowed some of that to show through against Bolivia.